Last weekend we celebrated Kasper’s 1st birthday at a campground. Not an ideal place to bring a fancy birthday cake. Decorating the kiddos cake is a highlight of the party for me. The fruit pizza idea came to me one night as I was falling asleep. It is perfect! I could bake the crust and decorating it using Kasper’s favorite fruit. 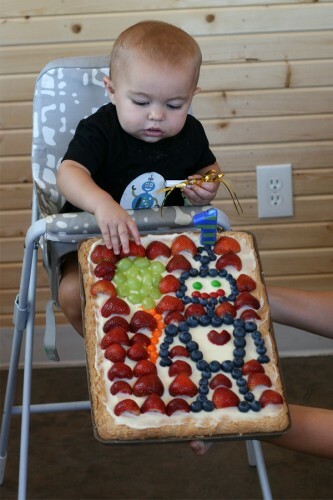 Plus I have WAY more fruit pizza decorating experience. I worked at the Hy-Vee produce department for almost 7 years, making countless fruit pizzas. 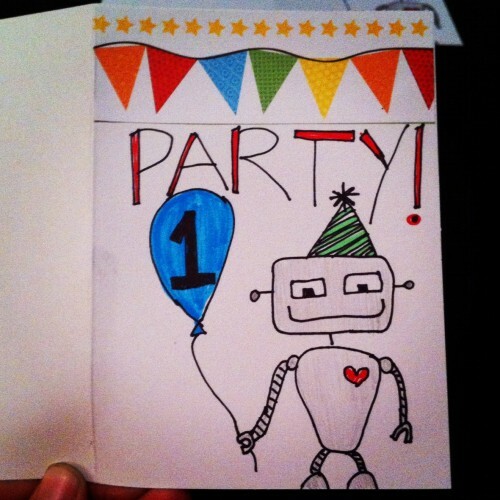 Robots were the theme of his party, but let your imagination run wild! I wanted Kasper’s “cake” to look like his invites I drew. Check out here for the post about his party. 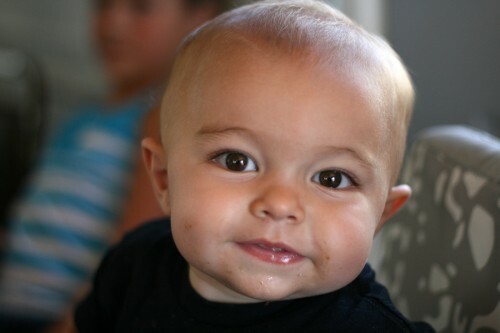 Warning cute baby pictures abound! This is one happy ONE YEAR OLD boy! For my fruit pizza shown I doubled the recipe. 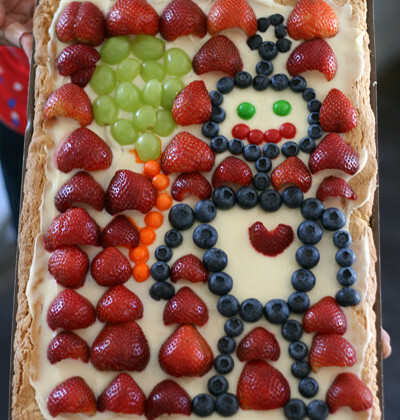 I used strawberries, blueberries, and green grapes for the robot. I used some Skittles for the balloon string and the facial features. In a separate bowl mix together flour, soda, cream of tartar. Set aside. In your mixing bowl cream together the butter and powdered sugar until light and fluffy. Add egg. Mix together. Mix in vanilla and almond extract. Line your baking sheet with parchment. Press cookie dough until the whole sheet is covered evenly. Bake for 20-25 minutes. Allow to cool completely before frosting and decorating or wrap in foil to decorate later. In a bowl mix together all ingredients until smooth. Spread on cookie crust.